A new company, offering sea transportation from the neighboring French islands, has launched its service in Dominica. Val Ferry, owned by Gei and Claude Vala, two brothers who previously owned and operated Caribbean Ferries, docked at Longhouse, Portsmouth on Friday 3 August 2018. 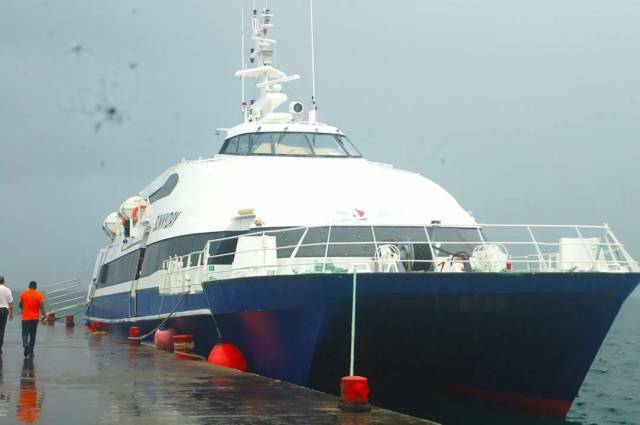 The new catamaran is scheduled to traverse between Marie-Galante, Fort-de-France, Les Saintes and Dominica. 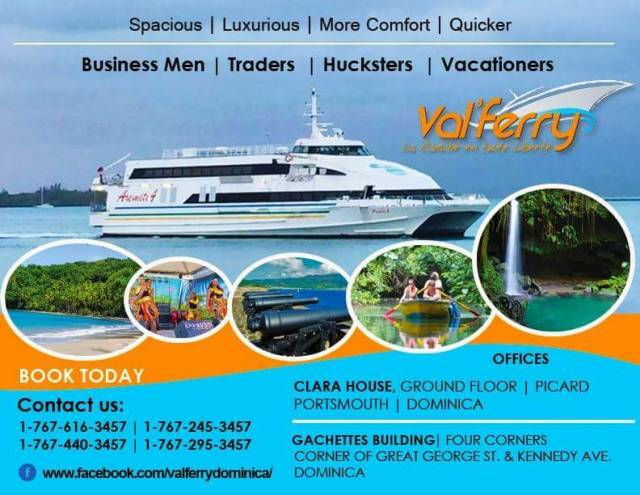 Manager and co-owner of VAL FERRY, Claude Vala told the inauguration ceremony at Longhouse on Friday that Val Ferry will operate flexible schedules to and from Dominica; one in the morning and the other in the afternoon. Vala said this day trip schedule will facilitate its partnership with Norwegian Airlines so that its international passengers can travel to Dominica without overnighting. “Access to Dominica has always been a challenge and by you being here it helps to alleviate that challenge and make access to get to Dominica easier,” Minister for Tourism and Culture, Robert Tonge said. He welcomed Val Ferry and expressed delight with the vessel which he said is “very spacious, it’s very clean, it’s very new”. “So I definitely look forward to working together with Val Ferry to ensure that we can make more persons aware of how to get to Dominica, it’s a lot easier to get to Dominica,” Senator Tonge said. Val Ferry will be docking at Longhouse, Portsmouth and for Mayor of Portsmouth, Titus Francis, this is welcomed news. He described it as “an indication of a ray of hope” and “a breath of fresh air” following the announcement of Ross University’s departure. “Dominica is a country that is blessed with a lot of natural beauty but with the natural beauty comes with natural problems,” Mr. Francis said adding that two natural disasters; Tropical Storm Erika and Hurricane Maria were primary responsible for Ross’s departure, as indicated by Prime Minister Roosevelt Skerrit earlier that day. “I am convinced that at the end of every tunnel there is some light and all is not lost for Dominica, all is not lost for Portsmouth,” Mr. Francis said. Further, he noted that, the introduction of a new ferry service between Portsmouth and Guadeloupe “is the beginning of a sign of new times to come, better times to come, better days to come for Portsmouth”. Never ask what ôthers can do for me but what can i do for ôthers. Hambrn you burn allready,Dominica is the People, not the land on which we stand.If we shut our clappers and open our hearts and hands we will Prosper. Good venture VAL. That’s good news despite airhead like Hambrin running his stupid mouth. I will take the ferry! Just land me in Portsmouth and i’m happy! Hambrin you sound as stupid as your name if you have nothing better to say go hide yourself is people like you that makes Ross pull out of Dominica. Hambrin if you have nothing to say keep your mouth quiet because you have no sense you sound like a empty barrel. Oh my! A new ferry service operating from the same run down, dilapidated, neglected and overlooked long house jetty. Is that all Dominicans deserve, inferior standards? When will this government begin to treat Dominicans and their needs as deserving of quality standards? When we should be seriously considering an international airport we are talking of ferry to bridge the gap. Shame on our politacians in power.